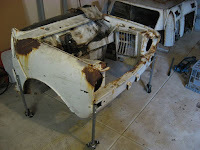 Note : There is much more detailed info about the build, hints, tips, info for the stripping the Mini & Starlet etc at my blog of the build at http://mearcat.blogspot.com Consider this ausmini thread an abridged version of the blog If you have any questions at all, don't hesitate to PM or email me. 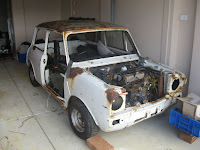 I found a 1978 Clubman in Bunbury, W.A. owned by a 17yo guy who had mostly stripped the shell and some of the engine - with intentions of doing an engine conversion of sorts but for various reasons, did not go through with it. 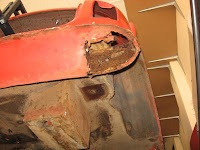 Overall the shell was in good condition but with only a couple of concerns - the rear valance corner had a hole you could put your fist through, the front valance was severely dented had enough bog in it to sink a ship and a hole in the passenger side sill. it had been on the market for 5 months and no-one seemed to want a half-stripped shell & half stripped engine so for the measly sum of $1000, it was mine. Another 5 hour trip from Perth to Bunbury & back was in order, this time with a trailer. 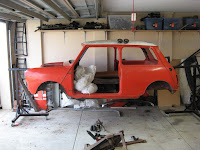 Unfortunately, we were half way through building our new house at this time so once it transported to Perth, the Mini was stored at a mate's garage for the next 6 months. 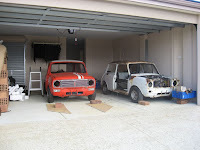 Once our house construction was completed, I moved the Mini to it's new home and at the same time, found a very neglected '75 Clubman (for $100) which had been out in a paddock with no glass or panels fitted, exposed for at least 2 years and quickly rusting away - The panels there was more holes and rust than straight steel and there was nothing special about the serial numbers. I wanted to strip this for some random parts and cut the shell in half so the front half could be used as a test rig for trial fitting the modified subframe & drilling any holes/brackets I may need. 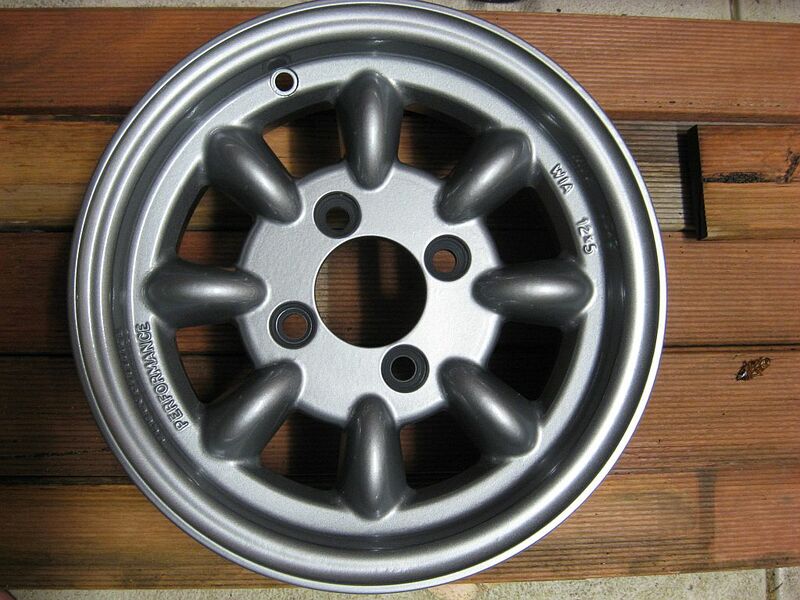 The plan is that Starlet engine and all ancillaries will be fitted to the white Mini and when completed, duplicated in the other Mini. 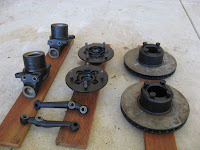 I stripped the rusty white Mini to bits, gave away the siezed engine, pulled off the various parts that I needed and dumped the rest at the scrap yard. Sara could now park her car in the garage for the first time. Needless to say, she was a happy chap. Last edited by Mearcat on Mon Apr 08, 2019 10:39 am, edited 38 times in total. 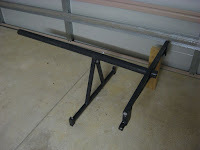 I have also fabricated a spit / rotisserie for the Clubman after it was stripped of everything over Xmas and New year holidays. 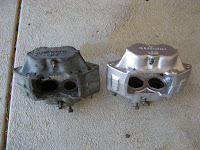 The question has been asked on the forums several times before how to do it on late model Minis since the hole in the firewall & boot was removed (around 1975-1976 I think). 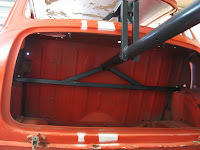 You can either put one piece of tube through the windows and entire length of the car (fitting as close as possible to the bottom of the window frames), but to balance the shell better when it’s rotated on it’s side or upside-down, you just need to keep the end tubes in the same position as the factory spit would have gone, but brace it more to the body. 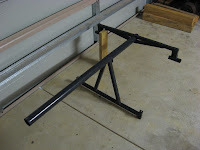 I have been advised by a sandblaster that as a precaution, to connect the bases of the end frames together so the shell doesn't potentially bend. The entire rotisserie cost me about $50. 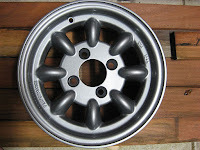 $35 for some 70kg EBay castor wheels and $15 in scrap steel from my local tip. 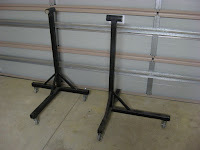 50mm square tube was used for the end frames, 25mm square tube for the main frames and some old metal bed frame pieces for the round tubes. 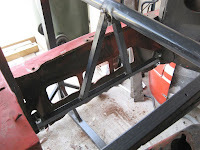 The front piece is attached to the subframe mounting points. 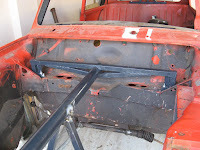 The rear piece is attached to the rear shock mounts and rear seatbelt mounts on the parcel shelf. That spit is the same design as one of mine. The rear bolts onto the seat belt holes up top, but where dose your bottom section bolt onto? 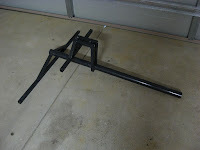 Top job on the spit AL , that will make life so much easier. worked the spit is much easier and more accessable. To be honest, I think it might have been your spit design which I got inspiration from The bottom section of the rear piece bolts through the shock absorber holes. 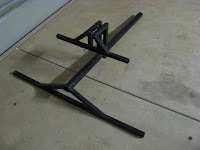 I still have to weld some tabs (or holes) to allow the due to be locked into place while it's semi-rotated. Looks like a pretty good shell for the project, cant wait to see the progress. Yeah the spit attaches the same as mine, I've sat in it grinding and haven't noticed any flexing in the shell or the spit so IMO it should be fine Also when your done with the donor clubby nose you can convert it into a BBQ . Looks Good Alan, and loved reading the blog too. Your link above has a dot in the wrong place so doesnt work properly (the dot after the .com). I got a set of 5 12x5" Performance Superlite mags second hand, suffering from a bad case of gutter rash and various scratches. 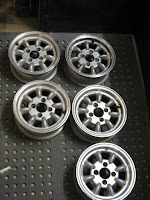 These were cleaned up, sanded back where necessary and esnt off for sandblasted and powdercoating. 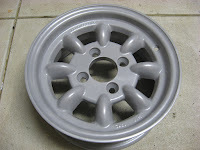 I asked for a bright silver powdercoat and got a primer grey colour instead! 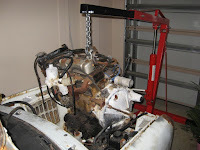 Now that the Mini is on the rotisserie, it gave me a better chance to spin the whole shell around tonight, lock it in place (there is a bolt goes through the end frame & front tube piece), and check for any more rust underneath. 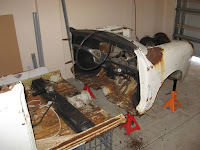 All is well with the floorpan. The battery box has a hole in it which will have to replaced. The rear valance box section in the RHS corner was completely rusted out and covered in bog. Some dodgy bugger had stuffed the area with newspaper and bogged over the top! I managed to find a date on the "West Australian" newspaper - Saturday 13 December 1997. Merry Xmas - here's some bog for the festive season. Not hugely important I know, but it's interesting to know it's been in Western Australia for at least half it's 31 year life. The top side of the valance was dented and the seam also full of bog so I just bought a new panel to replace it later. I plan to get the boot bum deseamed also. 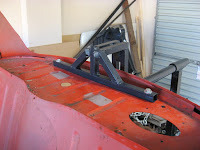 Next step - hit the underside it with a heat gun, wire wheel and get all the underbody sealer off. Time to get dirty! 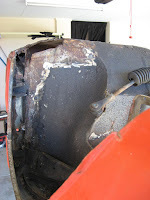 I've been working on the shell over the weekend and scraping off the underbody sealer and other areas (readying for media blasting) and have revealed more rust and some repair attempts. The right hand half the rear valance is being completely held on by bog. 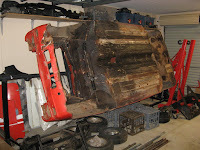 I also found the rear of both front wheel arches have had some sheet metal welded over (but not fully sealed) some rust. 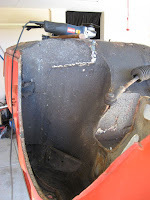 I grabbed the grinder and cut away the sheets that were welded in the wheel arches and found some pretty big holes! Before & After (The shell is upsidedown in these pics). That is a pretty large hole. Im glad im starting out with a clean shell. Can you buy a replacement panel for that? or is it going to be custom? Holy crap and I thought the hole in Hetty was big.. Nice progress your making there Alan..
What are you using for a jig to make the subframe? I have made the mistake of using a mini front cut - I wouldn't recommend it. But he's thriving and striving and hugging the turns.